After using a MULTIVAC chamber machine during MasterChef, 2015 winner Simon Wood knew that a MULTIVAC machine was a necessity for his new Manchester-based fine dining restaurant. Having opened mid-year 2017, Wood � Manchester was a lifelong dream for MasterChef UK winner, Simon Wood. Simon�s 2015 win turned his dream into a reality and allowed him to open a restaurant which would give visitors an �unintimidating fine dining experience�. With its stylish yet relaxed approach to fine dining, Wood � Manchester aims to offer modern interpretations on traditional flavours, focusing on simplici-ty and purity. Head Chef, Mike Jennings plays a vital role in looking after the kitchen, and creating new and inspiring menus alongside Simon; helping them achieve status of one of the very finest restaurants in Manchester. With MULTIVAC�s tabletop machines being used on MasterChef throughout the years, Simon was already familiar with using a vacuum packing chamber machine, and knew that MULITVAC machines were re-nowned for being the best on the market. When fitting out the new kitchen, Simon was put in contact with Chamber Machine Product Man-ager, Craig Mahoney to fulfil his packaging requirements. As a brand new restaurant, a MULTIVAC chamber machine was a necessity for Wood � Manchester�s kitchen. High quality products are the foundation of success for any fine dining restaurant, and the MULTIVAC C 200 chamber machine is the basis for excellent quality and reliability. 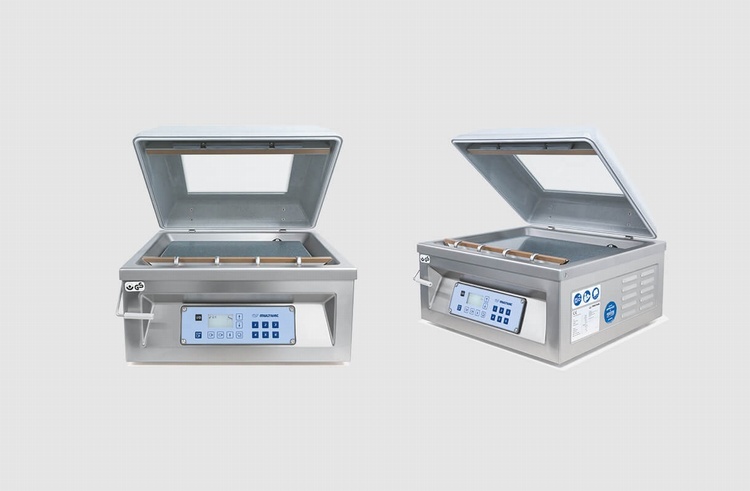 The need for two vacuum packing cham-ber machines diverted from wanting to be able to pack raw meats, as well as cooked products for sous-vide cooking (EHO Legislation). To keep to this legal requirement, the C 200 machine has a stainless steel hygienic design with sloping surfaces and is therefore easy to clean. The first of the two C 200 machines is used to prepare the meats, in-crease shelf life, reduce wastage and better storage of their produce. One of the key features of the C 200 is its MC06 control panel with reci-pe storage functionality. This feature is advantageous due to its ease of operation and reduction in operator tampering, resulting in less risk and waste of product. Another feature of the control panel is its vacuum sen-sor control, enabling repeatable accurate vacuum levels and resulting in consistent quality. The second machine is used for sous-vide cooking and product infusion. With the restaurants focus on offering traditional and pure flavours, the C 200 machine vacuum packs the product to intensely infuse it with au-thentic flavours before being sous-vide cooked. MULTIVAC visited the team at Wood � Manchester to hold a customised training course on the C 200 machine. All content from the training course, both theory and practice, was taught directly using their ma-chines and so ensured the restaurant�s employees were fully competent in using the machine efficiently to achieve the best results.